ANCHORAGE, Alaska (AP) — A four-time winner of Alaska's Iditarod Trail Sled Dog Race who was recently accused in a dog-doping scandal has signed up to participate in Norway's Finnmarkslopet race next year, a spokeswoman said Thursday. The announcement came weeks after Dallas Seavey withdrew from next year's 1,000-mile (1,610 kilometers) Iditarod. It will be Seavey's first sled dog race in Europe, said Elise Houren, a spokeswoman for the racer. 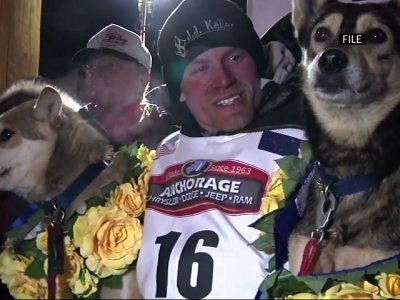 ANCHORAGE, Alaska (AP) — Alaska investigators say no evidence of animal cruelty was found after an animal rights group complained about a kennel operated by four-time Iditarod champion Dallas Seavey, who was recently accused in a dog-doping scandal. The Matanuska-Susitna Borough said the investigation was conducted Saturday on the kennel, which is in Willow. Alaska State Troopers also are separately investigating complaints against a kennel, but they won't identify the musher. An animal welfare official in Alaska says he found no evidence of animal cruelty or neglect at a kennel operated by four-time Iditarod champion Dallas Seavey, who was recently accused in a dog-doping scandal. ANCHORAGE, Alaska (AP) — Cycling. Baseball. Track. Horse racing. Now dogsledding has become the latest professional sport to be engulfed in a doping scandal, this one involving the huskies that dash across the frozen landscape in Alaska's grueling, 1,000-mile Iditarod. Organizers of Alaska's Iditarod are acknowledging the famed race is in its darkest time as it grapples with fallout from the first doping scandal in its history. Still, Iditarod CEO Stan Hooley said Tuesday he's confident the Iditarod will "emerge from this storm and move on." Four-time Iditarod champion Dallas Seavey denies he administered banned drugs to his dogs in this year's race, and he has withdrawn from the 2018 race in protest. The Iditarod Trail Committee on Monday identified Seavey as the musher who had four dogs test positive for a banned opioid pain reliever after finishing the race last March in Nome. ANCHORAGE, Alaska (AP) — Here are the top 20 finishers in this year's Iditarod Trail Sled Dog Race. Iditarod officials said several dogs on a team tested positive for a prohibited drug, but officials are not identifying the team, saying they likely could not prove legally prove intent on the affected musher's part. Only the first 20 teams are tested in Nome, where the finish line is located. ANCHORAGE, Alaska (AP) — Mitch Seavey won his third Iditarod Trail Sled Dog Race on Tuesday, becoming the fastest and oldest champion at age 57 and helping cement his family's position as mushing royalty. ANCHORAGE, Alaska (AP) — A father and son continued to battle for the top spot in the world's most famous sled dog race, despite another veteran taking the lead Sunday night. Mitch Seavey, a two-time Iditarod champion, was the first musher out of the checkpoint in the village of Kaltag on Sunday, leaving at 4:40 a.m. His son, current champ Dallas Seavey, departed five minutes later. ANCHORAGE, Alaska (AP) — Wade Marrs leads out of the halfway point of Alaska's Iditarod Trail Sled Dog Race. The 26-year-old veteran musher left Huslia at 7:05 p.m. Friday with 14 dogs. Current champ Dallas Seavey was 34 minutes behind him to take second place, after dropping one of his 14 dogs. ANCHORAGE, Alaska (AP) — Former champion Mitch Seavey reached the Yukon River city of Galena and leads the Iditarod Trail Sled Dog Race. ANCHORAGE, Alaska (AP) — Mushers are jockeying for the early lead in the world's most famous sled dog race. ANCHORAGE, Alaska (AP) — A champion musher eyes an elite status, non-Alaska like weather continues to play havoc and competitors for the first time will carry cell or satellite phones in cases of emergencies. Those are among the highlights of the 2017 Iditarod as Alaska prepares to play host to the world's most famous sled dog race. ANCHORAGE, Alaska (AP) — The Iditarod's new communications rule will stay largely intact despite opposition. KTVA-TV reports (http://bit.ly/2ffGgcI) mushers will be able to carry two-way communication devices as well as GPS and tracking gear, but must have Iditarod Trail Committee approval to use the technology to contact the media. Board members decided Friday to remove a part of the rule that said mushers would be disqualified if they used devices for outside assistance and coaching.